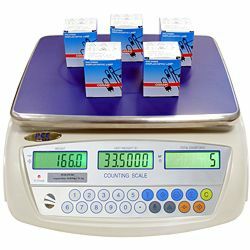 Inventory scale is designed for professional counting and weighing. Both memory cells and the possibility of being powered by an accumulator turn this inventory scale in an irreplaceable device. This inventory scale is the ideal instrument to determine the amount of pieces accurately, for instance while carrying out inventories. When piece counting function is active, the single weight of a piece is determined by the scale, but if value is known, it can be entered via the keyboard. If a number of pieces is placed on the scale, the inventory scale will be able to show the weight, the reference weight as well as the amount of pieces placed on it. By means of the optional printer of labels, weighing results can be printed directly. Printing is automatic when the value on the display is stabilized. A previous tare can be performed or it is even possible to introduce the reference weight via the keyboard. RS-232 interface is available for the inventory scale. Through the optional software weighing data can be transferred to a computer. At this link you will find an overview of inventory scales available in the offer of PCE Instruments company. - Weight, quantity and reference weight can be indicated. 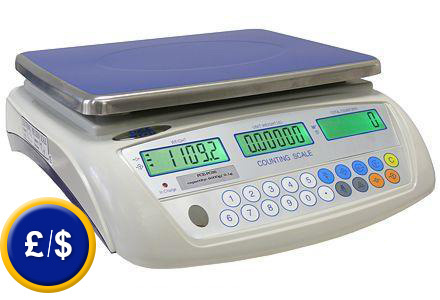 - Due to its high resolution piece counting function can be used as a reference weight. - Inventory scale with taring function. - It is possible to manually introduce both previous taring and reference weight. The kit includes a software for transferring the weighing data to a PC or Portable and RS-232-cable. Sofware is used to transfer data to a computer with the date and time. The transferred data can also be sent to other software such as Excel. If you have USB interface in your PC or portable, you will need USB adapter. The compact scales software kit is normally delivered with RS-232 cable. If you wish to transfer data to a portable or PC, you will need the USB adapter ( drivers are included). The printer is used for direct output of weighing data on adhesive lables. It will be delivered including RS-232 cable, USB-cable, net adapter. Labels width can be regulated (max. 100). A paper width 52 mm is delivered for 50x36 mm labels. For those companies which want to include the compact scale into the group of control tools or for annual recalibration. ISO certification comes with a laboratory certificate including measuring values. The company's or customer's details can also be included. Here you will find an overview of all the scales and balances available in the offer of PCE Instruments..